I have loved reading birth stories for quite a while — way before I was even thinking about having a baby. I’m not sure exactly what it is about them that I find so fascinating. Maybe it’s that each one is so different and it’s fun to get a glimpse into such a special part of someone’s life. 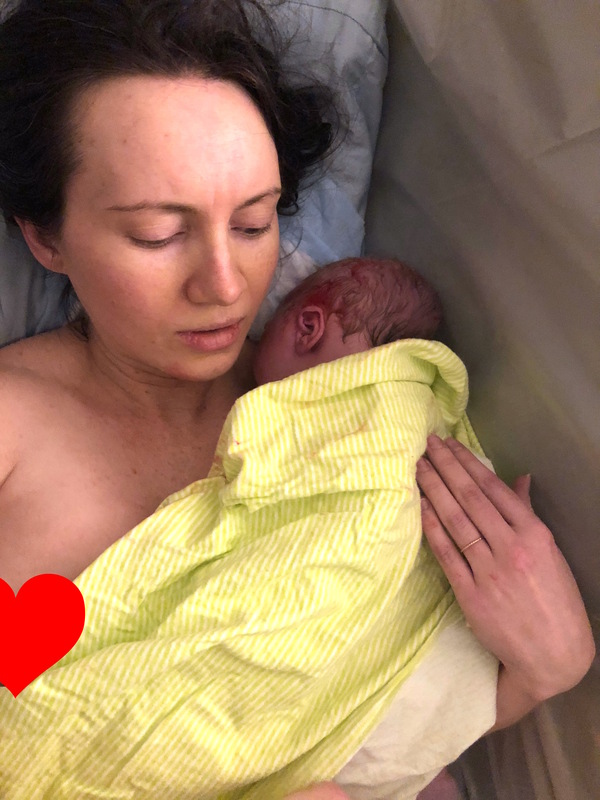 Because I love a birth story…and I wanted to be able to remember the details of my birthing day… here’s mine! ** One note: I took Hypnobirthing, where we’re taught to refer to contractions as waves…so that’s why you’ll see me using the term “waves” throughout! I was due on January 1st, but I considered that an estimate and figured the baby would arrive anytime between 38 and 42 weeks. On Friday, December 29th, I woke up around 5 A.M. (highly unusual for me) with what felt like a really long-lasting menstrual cramp. It lasted about 30 minutes, with no fluctuation, and I couldn’t get back to sleep (also highly unusual for me). My family was in town, and that whole morning I just felt so loopy and out of it. 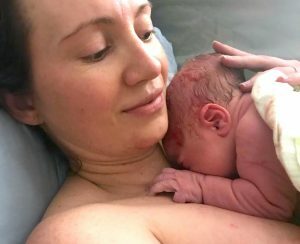 My midwife was coming for my weekly checkup that day, and I was so out of it that when I saw her I felt like I could barely string words for a sentence together. She said this was normal (as was the cramping) and that it indicated my body was preparing but that there was no way to tell what day would be THE day. That weekend we went to Brooklyn and explored Central Park and I generally felt really great. The out of it feeling disappeared. The next Friday morning, January 5th, I again woke up with a mild cramp that lasted 30 minutes and then I felt really out of it. My midwife was coming for my weekly checkup that day anyway and when she saw me she said that I had the look of someone who was getting close. Because I would be 41 weeks that coming Monday, I had to schedule a biophysical profile sonogram so that they could make sure that my amniotic fluid levels were within normal limits and also estimate the size of the baby. I made the appointment for Monday at 10 A.M. I personally wasn’t concerned about being 41 weeks and was just envisioning the extra time providing my baby with chubby cheeks and chubby thighs and lots of healthy growth! It was in the 20s on Friday, but my parents and I decided that we all needed a walk, so we bundled up and walked to a local grocery store. As I was putting on my shoes my mom commented that I looked like I was “in another world.” I was definitely feeling such a sense of calm, but also a bit out of it again. That night we roasted a chicken and some veggies and had a friend over to watch funny TV shows. It was a really great night and it kept me up later than I’d been staying up — around 11P.M. As I fell asleep, I could feel a mild cramping coming and going. I slept through the night (or so I thought) and woke up around 6 A.M. Saturday morning having irregularly spaced waves. They would come every hour for a while and then every 30 minutes and then not at all for a few hours. I was also incredibly exhausted. My doula explained that I’d likely not slept deeply the previous night because of the waves, even though I didn’t remember waking up. I talked to my doula and midwife, and both suggested I rest as much as possible while the waves were irregular. This way when the waves became more regular and intense, I’d have saved up some energy. I stayed in bed all day sleeping, eating, and reading and still felt like I needed more sleep. I ate toast with butter and some lamb and veggie stew my mom had made and tried to stay really well hydrated. As the day progressed, the waves became stronger and more regular. I used my Rainbow Meditation and Happy Place Meditation that I’d learned in Hypnobirthing. These helped my breathing stay more calm. By 8 P.M. waves were coming every 10-20 minutes and lasting 30 seconds to one minute each. They were also all in my lower back. I would say “Wave!” and my husband would come over and apply firm pressure to my lower back. Lying on my side was the most comfortable for me, and the lower back pressure during a wave was really helping me be able to continue to breath through it. The remainder of Saturday night and Sunday morning were spent trying to doze off in between waves, which were steadily arriving every 10-20 minutes. Sunday morning my waves got more intense and more frequent, still lasting about one minute each. My husband was tracking them using an app, which was really helpful because at this point I certainly wasn’t going to be doing any bookkeeping and the app had already recorded more waves than either of us could keep track of. Jared was also in communication with both my doula and my midwife on Sunday to keep them posted. My doula arrived around 12:30 P.M. By 1:30 P.M. she’d seen me go through a few waves and encouraged me to change my position a bit (I was still lying on my left side in bed at this point). Leaning on Jared, I walked laps in our apartment, with my doula rubbing my back during waves. By 3 P.M. my midwife had arrived, and the vibe in the apartment was very relaxed as we all waited for this baby to make a debut. My husband and doula set up the birth tub, and I got in at 5 P.M. I now fully understand why the tub is often called the “midwife’s epidural.” It really relaxed me, reduced the intensity of my back labor, and allowed me to sort of re-center. At this point my doula was starting to wipe my face and shoulders with an icy cold wash cloth every few minutes, which helped to keep me from overheating in the pool. I got out of the pool around 6 P.M. In case you can’t tell, I was TIRED. The birth assistant arrived right around the time I was winding things down in the pool. From the pool I moved to our couch and labored there for about an hour. Then I moved back to the pool for about 30 minutes. At this point I wanted to lie on my side again and went back to the couch. My midwife suggested that I try to pee, but I wasn’t able to. Once I was on the couch I started to want to push. I started tightening my diaphragm with each wave and trying to relax everything else. I did this on my left side for about 45 minutes until my midwife suggested I change to a position where I could pull my knees toward my body. 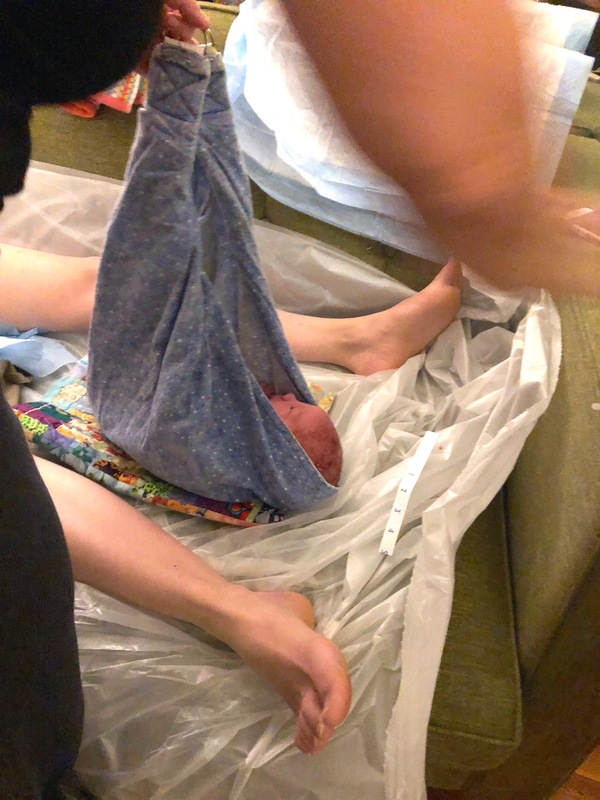 At this point I was so exhausted that I couldn’t do this myself, so my husband, the birth assistant, my midwife, and my doula all took turns holding my legs during contractions. After about 2 hours of pushing, my water broke and actually made a popping sound! At this time my midwife said that my bladder was full and was preventing me from doing the type of strong, deep pushing I needed to do. I had a choice to either get up and try to pee or to have her use a catheter to empty my bladder. I chose the catheter, which tells you how exhausted I was. It was amazing once my bladder was empty how much more powerful my pushing was. 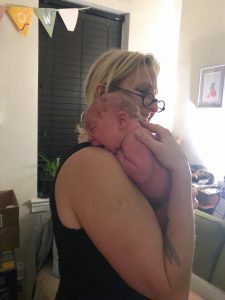 My midwife and doula were offering amazing coaching at this time, which was so helpful because I had no idea what time it was, how long I’d been pushing, or how close the baby was to being out. At just after midnight on Monday morning, after almost 4 hours of pushing, August (Augie) arrived. Meeting Augie for the first time! Welcome to the world, Augie! He was larger than anyone was expecting (9 pounds, 21 inches) and was born with his right arm up across his face. After he was delivered, my midwife gave me a shot of Pitocin, to prevent any excessive bleeding since I’d been laboring for so long. I sat on the couch and snuggled Augie for a while, and then my doula and birth assistant helped me to the bathroom to get cleaned up while my husband had skin to skin time with the baby. My doula, who’s also a lactation consultant, stayed to see Augie do his first latch and then we all sat down and ate smoked salmon on toast together and waited for my parents to come over. We also got to look at the placenta, which was pretty incredible. Augie and my midwife, Shar. I was exhausted and happy, and my parents ended up holding Augie in the glider all night so my husband and I could get some sleep. Check out http://cjnutrition.com for more practical nutrition needs and advise!